This blog post is part of a paid SocialMoms and Mott’s blogging program. The opinions and ideas expressed here are my own. 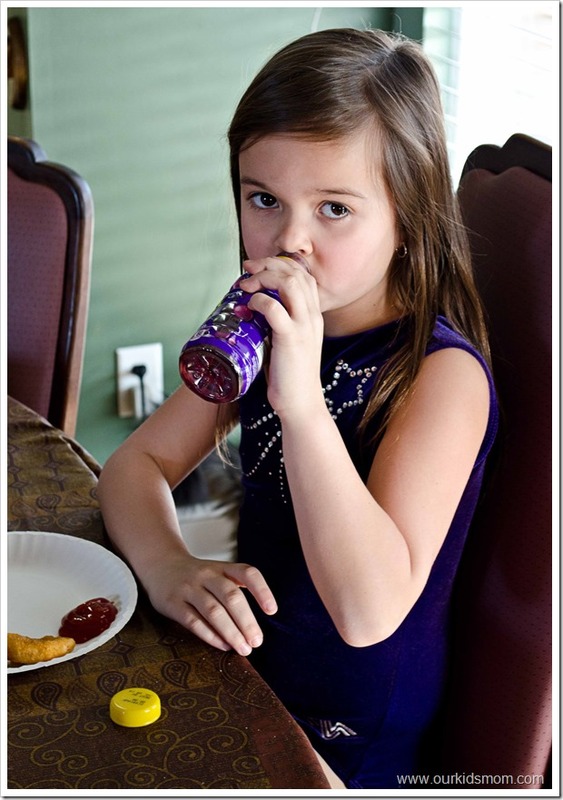 What my children eat and drink is always a concern of mine. I read labels and I try my best to purchase “real” food and avoid artificial sweeteners. I also limit my children’s sugar intake (my kids are sweet enough without it). I am not perfect by any means and I have been known to allow the occasional indulgence, but until recently my children rarely drank anything other than milk or water. I never understood why companies add more sugar to a drink that is already sweetened with natural sugars, know what I mean? Then I was asked to try Mott’s new line of juice drinks: Mott’s Fruit Punch Rush, Mott’s Wild Grape Surge, and Mott’s Strawberry Boom. Both of my children were eager to try Mott’s Wild Grape Surge. I wasn’t even given a few minutes to chill them, they drank them room temperature straight out of the shipping box. To say it was an instant hit was an understatement. 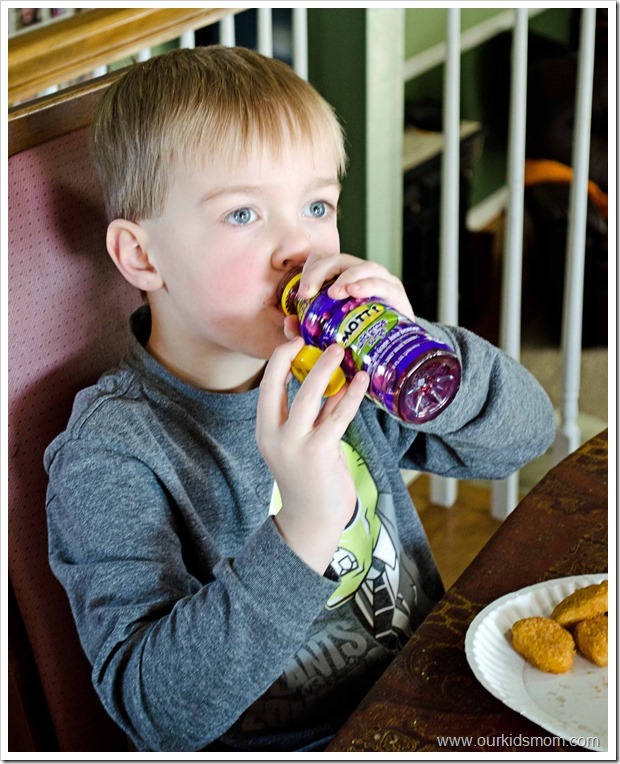 Emma and Ethan were not the only people in this house that enjoyed the new juice drinks. My 17 year old son had to be chastised several times for drinking straight out of the bottles. His favorite was Fruit Punch Rush, but he asked to buy them all. I may indulge them with this one… finally a great juice that is fine for everyday drinking, not just for special occasions. 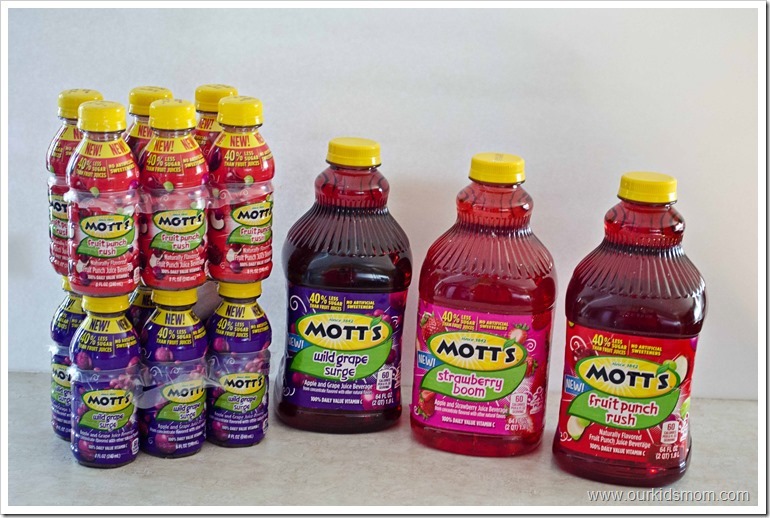 I am glad that these Motts drinks have less sugar and are sweetened with Stevia. I shall look for them at the supermarket. Thanks for the coupon. I’d rather drink 100% juice if I’m going to drink juice. I usually add some filtered water. These new flavors sound really good and are ones my son is sure to love. I love the less sugar and vitamin c that they have. I actually already buy this and drink it myself. I love the 40% less sugar, as I don’t like drinking sugary drinks at all. So this is my 1st go to pick when I want juice. Very good too! I really appreciate that it has no artificial sweeteners! My kids never drink juice on an everyday basis, but would definitely enjoy a Mott’s juice drink in their lunchbox on occasion. These would be perfect for in school lunches. I don’t usually buy many juices for the same reasons as you. Why are they all loaded with sugar? Plus so many of them are not even real juice. These sound great! I will have to look for them. Thanks! My granddaughter’s both love Motts, especially their flavored applesauce. Glad to see their making healthy juice for kids made with real fruit juice. I also like that they are not loaded with sugar. Think we will give these a try. Thanks.